Purified water system, window screens, 8 bed, 5 bath. Layers of security. Casa del Oasis is about a five minute walk to the Mercado, the artisan market and the main grocery store. 15 minutes to the center of town. The house is located in a quiet neighborhood, at the end of a private gated drive. It is an easy walk to the park in the center of town, all the ruins and churches, as well as the many wonderful places to eat and shop. There is a maid who comes three days a week to clean the house and wash linen as needed. If you need a maid to cook, shop for groceries, or wash laundry and iron, this can be arranged. You will need to pay her for her extra hours. Hourly rate is minimal. The property offers secure off road parking for one car. 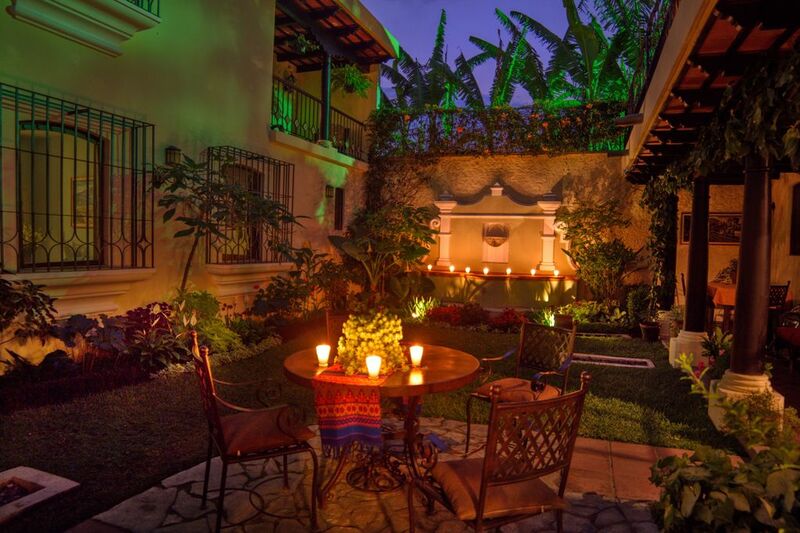 The house is laid out in the traditional Spanish colonial 'U' shape with an enclosed courtyard which includes a fountain, lovely plants, outside dining and seating areas. There are two bedroom and three baths downstairs in the main part of the house. Directly across the courtyard is the servant's wing. There are two bedrooms (one has twin bunk beds and bath), as well as a full laundry area. Upstairs is the master bedroom/bath, as well as an exit to the terrace with dining and relaxing areas, as well as a hot tub. There is also a trundle bed in the upstairs hall. The bottom part of the 'U' contains the living room, dining room, kitchen and garage area. All furnishing are new or antiques. There is WIFI and cable TV. There are several seating areas on the upstairs terrace and a small quiet garden to one side of the house that is a nice space to sit and read as well as the main courtyard. There is an extensive water purification system so you can drink the water straight out of the tap. There is also a cistern so when Antigua is out of water, you are not. There are also several levels of security. Having rented houses in Antigua before buying this home, we stayed in some lovely places but they were either very noisy, had poor ventilation, lack of security, impure water, too far from town or just not comfortable. We have made this home as comfortable and convenient as we can for ourselves and our guests. Airport pickup can be arranged. If you are staying for a month or more, we will provide airport pickup free of charge. We can also arrange groceries to be in the home when you arrive and a cook if you need one. Hotel Soleil is close by and for about $10 a day you have pool access. There are also other hotels with pools that are available for a small fee. When staying for a month or more, we will pay the first $75 a month of the electrical bill. Electricity is expensive here so we encourage renters to conserve. We live on Whidbey Island Northwest of Seattle. After having vacationed in Antigua for three years, we decided that was where we wanted to spend part of the year once we retire. At present we can only make it down to Antigua a couple of times a year for short stays. After traveling around for several years we went to Antigua when a friend recommend the town to us; she said we would love it because of its history, ruins, (UNESCO site), fabulous restaurants, rural farming areas close by, the cosmopolitan feel to the town and of course the climate. She was right. On the third trip down we decided to buy this home. There were several things we were looking for in a house and this house met those requirements: close in, formal courtyard, larger home in a quiet neighborhood. A plus to this house is that it has a water purification system, several levels of security and mosquito screens on all the bedroom windows. toilet, shower, Just outside the door. Shared with another bedroom. New clothes dryer. Please use dryer as little a conveniently possible. It is very expensive to operate. There is a drying rack and small close line. Wood can be purchased at the local market. You can arrange for delivery. with WiFi throughout most of house. Upstairs terrace, downstairs courtyard and gardens. There is a pool at the convention center two blocks from the house. It is available for a fee of around $10. per day. Perfect location, beautiful garden and courtyard! Great views of 4 volcanoes. Always a quiet spot to relax and read the Bible. Fresh limes on the roof top deck. Denis was across the street if we needed anything. The fountain lulled us to sleep and the birds sang good morning; it was the perfect Oasis! Mucho gracias to the owner! Thanks for such a beautiful house. We have been to Antigua many times and really loved your home and its location. It is in a nice and safe area, well decorated and comfortable. Next door Denis and Jazmin were available to greet us, to answer any questions and deal with any issues that arose. Angelica cooked several wonderful Guatemalan meals for us. We recommend this home as a great option while in Antigua. My family of 4 and 3 of my Spanish students stayed at this amazing house for 3 weeks in June 2017. The house is utterly beautiful and perfect for larger groups. There is plenty of space to spread out and escape from the stresses of being in a large group. The gardens are exquisite and the maid and gardeners are truly delightful. The location is perfect... not too far from the city center, but just far enough to be quiet and peaceful. We felt completely safe here at all times. The filtered water system is an incredible perk! It makes staying down south for an extended amount of time so much easier. I highly recommend this fabulous house. Staying there was definitely one of the highlights of our trip. Mil gracias! We stayed at this property for a week in April 2016. This was the perfect property for our family to spend the week at. We had more than enough room to spread out and enjoy our week in Antigua. The furnishings were beautiful and the gardens were an excellent place to spend the morning or afternoon reading and relaxing. The house is not too far from the market and main store to buy the necessary items that were needed for the weeks stay. Denis, the manager was available anytime we needed him and checked in with us via email or personal visit to make sure everything was ok for us. Angelica the maid and the gardeners were very nice and a pleasure to talk to when they were at the house. This place is everything and more than advertised. From the moment we arrived until the time we left we felt totally taken care of. Our group stayed here during a week of building a house for FromHousesToHomes.org. Staying at this house made it easy for us to have breakfast at home, make our lunches, and arrange for Angelica to fix evening dinner for us. Her food was amazing. Walking into the house at the end of a hard work day and smelling dinner was a great treat. In addition, the hot tub before retiring for evening was also a great addition. Also, I cannot say enough about the property owners and Denis, the property manager. One person in our group took quite ill toward the end of the week. Denis was right there to assist us and assist in arranging for an ambulance. Denis and his father were invaluable in helping us through this stressful situation. Both Denis and Greg and Judy, owners, have continued to check in with us on how things are going. I cannot say enough about how wonderful the house was and how wonderful it was to have the support of Denis and the Hansons. We are sure hoping to return again. If you choose this property you can be assured you will receive the best customer service ever! Our house is located at the end of a private gated neighborhood of 14 homes. We have a small community garden and playground where kids can play or you can just sit and relax. There is a mix of Guatemalans and expats living in the neighborhood. All homes are nicer properties. Neighbors are friendly and welcoming.